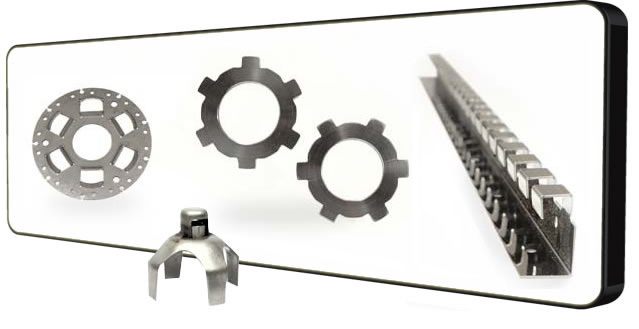 We use the latest technology to deliver the complete package for bespoke metalwork solutions. Using our unique manufacturing facilities and the wealth of experience within our team we can provide the best solution to your requirements. The team at our facility in the West Midlands are experienced in metal fabrication from presswork to laser cutting. We also have the specialist technology to manufacture bespoke tools for customers. With over 75 years’ experience in the industry, we have built long standing, established relationships with a range of metal suppliers, delivering quality sheet metal materials at competitive prices. A highly efficient cutting process to deliver high speed and accurate profiling of sheet metal products or components. Our in-house laser cutting and CAD/CAM software offers the utmost precision and accuracy that is harder to achieve using traditional cutting methods. Using our in-house metal press forming tools, we can manipulate different metal materials into the shape of a die to produce precise and accurate components. The process of metal press work, also known as metal stamping, is a cost-effective solution for the production of large batches. Our onsite metal processing facility can produce raw materials for the production of components. With onsite access to specialist machinery, our highly skilled team are able to fabricate steel through a range of specialist processes. We also supply a range of products as standard, such as security posts, suspension rails, meter brackets and pie hoops. We can manufacture these to size, based on your design requirements. Stainless steel is a highly strong and durable material, with an attractive appearance, resistant to corrosion and requires a low-level of maintenance. Duplex Stainless Steels have a high strength with greater corrosion resistance, in particular stress corrosion cracking, and has good weldability in thick sections. Super Duplex Stainless Steels are highly strong materials that are resistant to pitting, stress corrosion cracking, corrosion fatigue and erosion. Copper is a versatile material that is tough and can be easily joined. It’s corrosion resistant while offering electrical and thermal conductivity. Brass is a highly resistant material to corrosion that won’t rust, and is also fire resistant. It’s a versatile and durable alloy that is commonly used in plumbing. Mild Steel can easily be machined using a lathe, shaper, milling or drilling machine, and can be easily welded. Thanks to its malleability, mild steel is widely used for construction materials. Aluminium is a lightweight metal offering a high resistance to corrosion. It is a high performing conductor of heat and electricity. It’s also a good reflector of visible light and is widely recyclable. Unitech Blaymires is ISO9001 accredited. This means that we operate an effective quality management system in our manufacturing of pressings and fabrications that ensures that our products are made efficiently and to a high standard. The accreditation is renewed every 3 years, demonstrating our ongoing commitment to delivering quality products and services.